In this solo exhibition I explore personal frontiers of exchange, representation, identity and heritage intertwined with an investigation of the digital frontier of the database and its impact on knowledge production, dissemination and control. 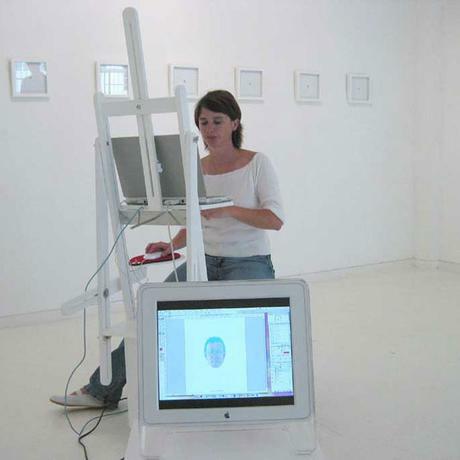 I have brought together the traditional interaction of the artist and the sitter in portraiture with the more contemporary interface of the computer as drawing tool and the digital print as output. The exhibition consisted of a number of elements. 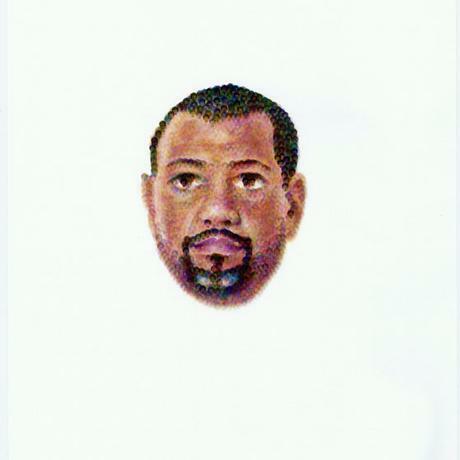 The first titled the Data series are digitally constructed miniature portraits of friends and family, drawn from life. 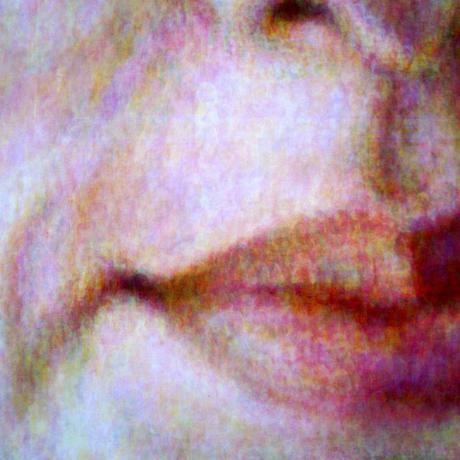 Starting with a single pixel brush (chosen as the basic building block in the visual interface of data), I draw an image of the sitter in front of me first in yellow, then magenta and cyan in separate layers in Photoshop. 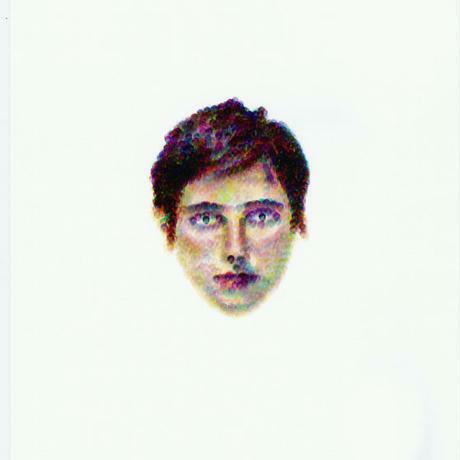 I have integrated colour separation into the process of observational drawing as a technical challenge, but also as a means to reduce all the portraits to the same units of colour (as happens in commercial printing). 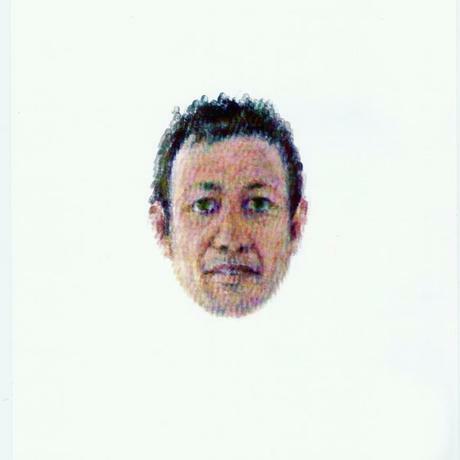 The separate colour layers of the digital image are then printed separately over each other. 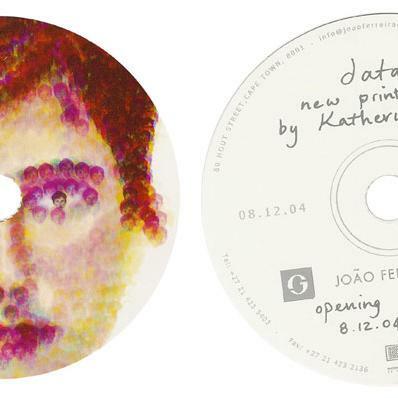 The final colour mixing takes place through the physical printing process, which is different to the digital image visible on the computer screen. 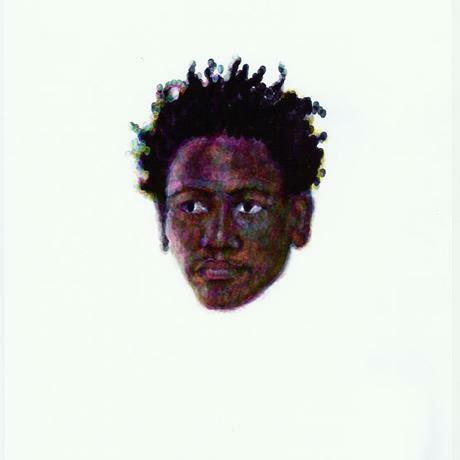 Each portrait print has been embossed using a compact disc as embossing dye. 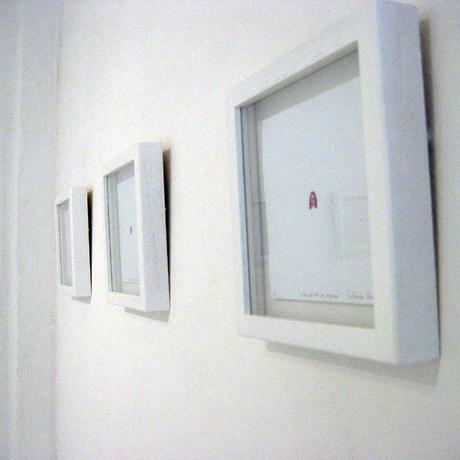 The CD shape frames each portrait, referring to their digital origin and a formal reference to their ambiguous status as ‘icons’. 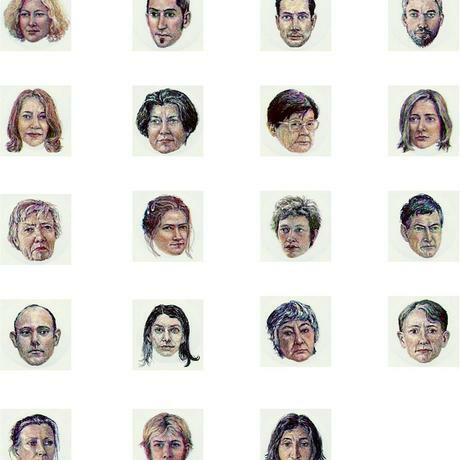 Catalog is a large-scale self-portrait created through the same process as Data, yet the basic drawing units become all the small Data portraits. 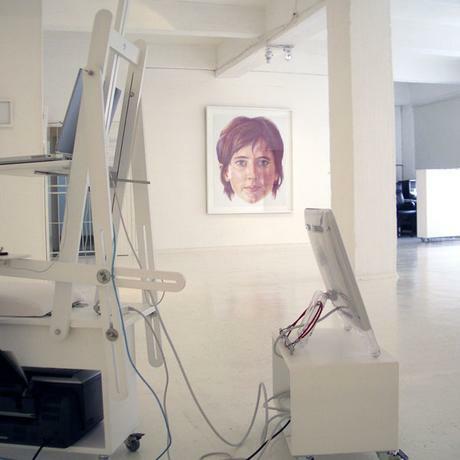 As the single pixel determines the scale of the Data portraits, their scale in turn determines the scale of the Catalog and the data visibly grows exponentially. 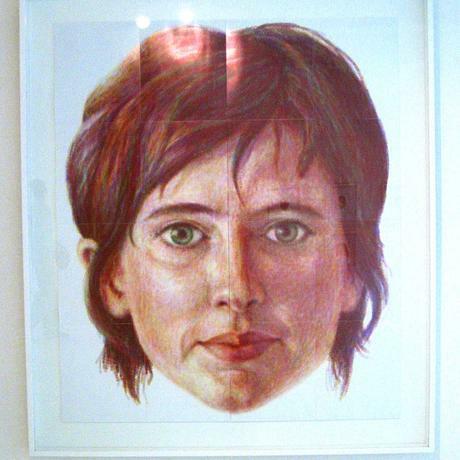 The massive self-portrait is both confrontational and expositional of an intense process of self-evaluation through hours and hours of mirror gazing. 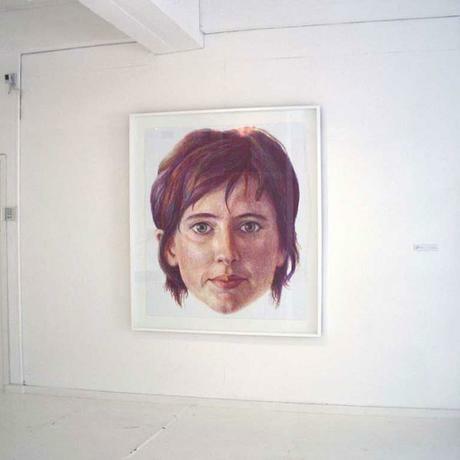 The large portrait also becomes a personal reflection on the construction of one’s own visual heritage as a database to offer an alternative to the inheritance and re-translation of existing visual media. 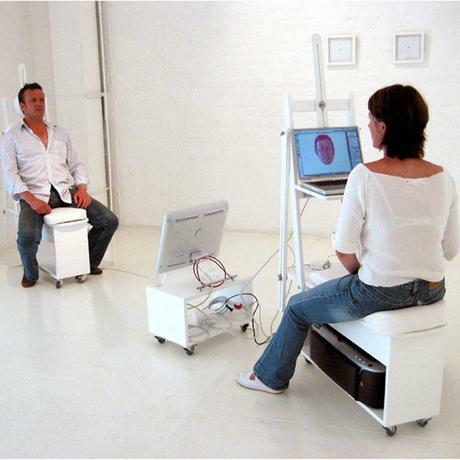 The Arena is an installation of specially designed and constructed studio equipment for the process of creating the portraits. 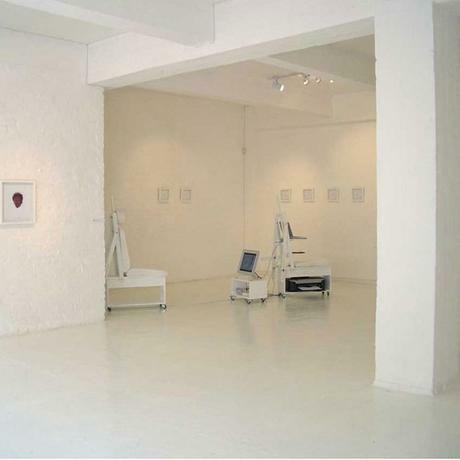 The Arena provides the space for the interface of the artist and sitter, the computer and the printer. 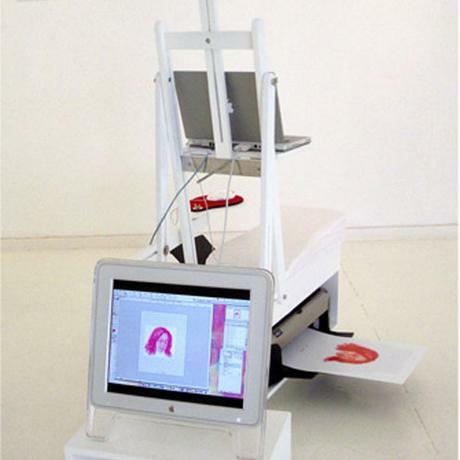 The equipment was designed as a hybrid of the traditional artists’ donkey used for painting and contemporary concepts of ergonomic computer furniture. On the invitation viewers were invited to come during the duration of the exhibition to sit for a portrait. 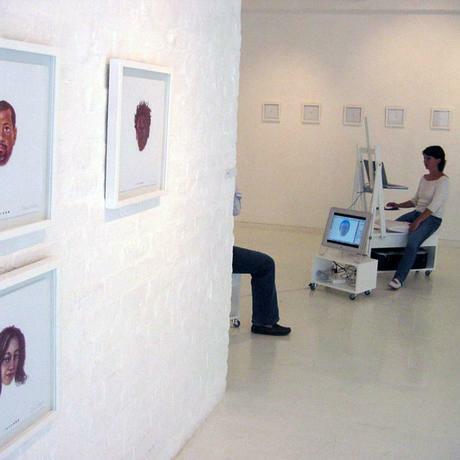 The result of this process was the Dialog series of portraits created as a performance during the exhibition. 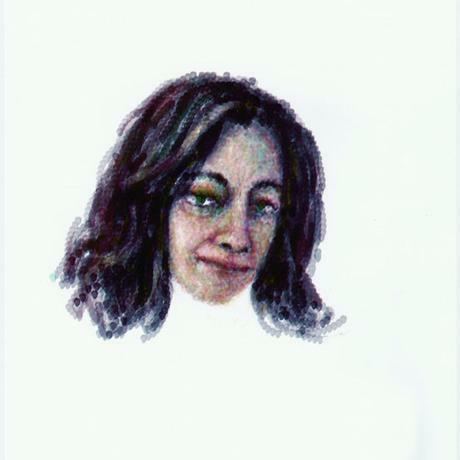 The first portrait in the series is a self-portrait used for the invitation, drawn using another self-portrait as the drawing unit. 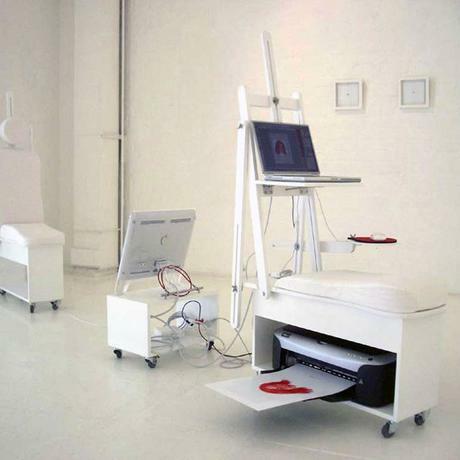 The next portrait is drawn using this resulting portrait as the drawing unit, and so on. 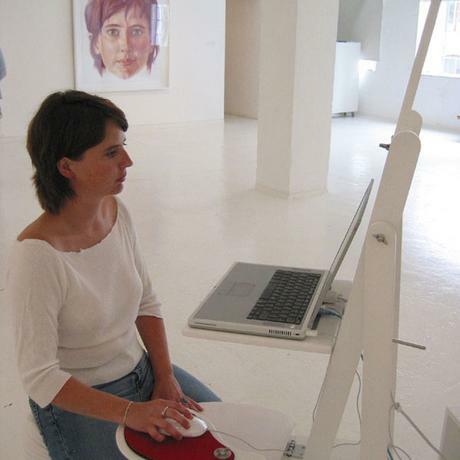 The workspace of my computer was mirrored onto a separate monitor so that the ‘sitter’ could watch their portrait as it was being drawn.